The Garment Center “Insider” Shopping Tour takes you on a “behind-the-scenes” VIP fashion expedition to 6 Private Appointment-Only Designer Showrooms (not accessible to the public) to shop exactly where store buyers, fashion editors and stylists shop. And at the same prices: WHOLESALE. Shopping is for current season “better” Apparel & Accessories at 50-70% BELOW RETAIL. Each tour has a mix of classic and more fashion forward options, suitable to a variety of ages. Who are the Designers? They are a mix of smaller successful names and the fascinating emerging stars. This is where the excitement begins: Best not to come with an item in mind, but rather to shop for pieces you have never seen before and will be thrilled to have in your wardrobe. And there’s more: Guests will have the opportunity to meet a designer or 2 in their showroom and learn interesting tidbits about the fashion industry and this renown area. At the conclusion, all are sent off with a complimentary comprehensive list of the SAMPLE SALES happening around town for post-tour independent shopping. 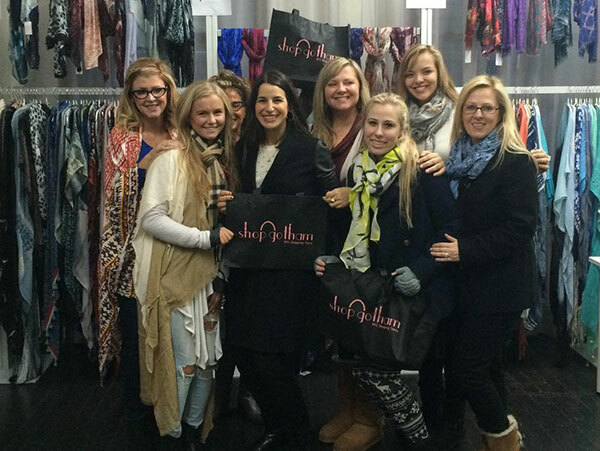 CUSTOM PRIVATE GARMENT CENTER INSIDER SHOPPING TOURS are available for groups of 3 or more women. For details, please visit our Private Tours Page or CONTACT US. If Accessories and Independence are “your thing” (or if you are here on a day outside out tour schedule,) Shop Gotham has an Exclusive opportunity for you. We will arrange for your group appointments with 3 Accessories Showrooms in the Garment District. Handbags, Scarves/Ponchos/Kimono Jackets and “Better Costume Jewelry” No Guide, but Same Wholesale Prices will be extended to you, welcoming showroom staff and a Modestly priced yet VIP program. If the “art of the hunt” is your wheelhouse, Comprehensive Sample Sale Lists are Available in the months of May, June, November & December (through 2nd week) – when the city is awash with exciting and ample options. Your list will be organized by neighborhood and include all of those we find to be worthwhile. A minimum of 10 for each itinerary. Note: Sample Sales tend to be BEST Tuesday – Thursdays. A Must-Do Shopping Tour – I have been fortunate to also have taken a shopping tour in Paris and Rome. We chose Shop Gotham's Garment Center tour as I was curious about shopping this area. What utter fun it was to go to the showrooms and get to buy some things at wholesale. This tour is completely different than what I have done in other cities, where part of the object was to have help finding our way around and speaking the language. I enjoyed this one just as much. New York is a never ending bevy of surprises! Advance Purchase required. NYC Tours Sell out! Maximum of 12 PERSONS per tour. Program is for WOMEN’s Items only. We do offer a special price for men who wish to accompany women (to carry bags or give opinions). These are walking programs and cover approximately 4-5 city blocks. Sampling of pricing: A Dress retailing for $325 will be available for approximately $140; Handbags retailing for $450 will be approximately $200. A Scarf retailing for $90 will be approximately $38. A shirt retailing for $190 will be approximately $80. Each program visits 6 Showrooms. Most showrooms accept Credit Cards; occasionally, there is one which accepts Cash only. Best to come prepared with both. In case of need, there are several ATM’s on every block. During Peak Sample Sale Seasons (May, June, November, December) we may swap out 1 of our private appointments for a public sample sale, to give guests the opportunity to shop a very famous luxury brand. This is NOT a fabric and trim or SightSeeing tour. 38th and Fashion Ave (7th).